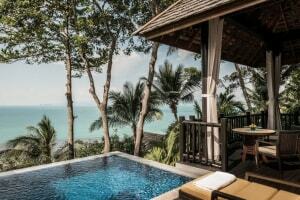 Minutes away from its own private beach, Four Seasons Koh Samui makes time stand still with its beauty and elegance. With 63 plush residence villas made for both couples and families, the resort stands next to the pristine emerald-blue sea, with soaring palm trees around. It has four on-site restaurants and bars, infinity pools that sweep you off your feet and Asia's only Rum Vault with an extensive collection of rums from all around the world. Along with this, guests can also enjoy water sports on the beach like kayaking and paddling or sprinkle some magic with a romantic movie night on the beach. Experience fine Thai dining on the clifftop, surrounded by the mesmerizing sea views as background. Relish Southern Thai cuisine prepared from locally caught fresh seafood with a glass of your favourite drink at Koh Thai Kitchen and Bar. The restaurant serves all three meals of the day plus afternoon tea. The bar opens from 12:00 PM in the noon till 11:30 PM in the night. 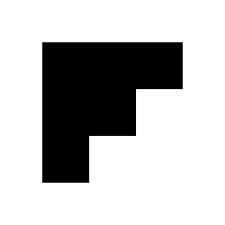 Make your vacation a fabulous one with Four Seasons resort's on-site restaurant, Pla Pla, that serves you Mediterranean cuisine. Along with an extensive a la carte menu of gourmet treats, you can also savor Beach Barbeque on Mondays. Welcome to CoCoRum, an elegant poolside lounge with Asia's only rum vault. Fully furnished with timber work and swanky decoration, the place offers you cozy daybeds and seating area near the pool where you can enjoy some enticing drinks throughout the day. You can also request some Latin-American snacks and bites along with perfectly blended cocktails. CoCORum also serves lunch and dinner plus non-alcoholic beverages. Famous for its wide collection of signature Thai wines, join Koh Bar for more than fifty Old World and New World labels. Surrounded by lovely tropical views, Koh Bar provides an elegant seating area with swanky sofas, copper decoration, fabulous drinks and quick bites. Four Seasons Spa pampers you with their numerous wellness therapies, massages, and rituals. Rejuvenate and ease yourself as the professional therapists give your body and mind complete relaxation and take you to your tranquil zone. The soothing decoration and lovely natural surrounding accentuate your blissful experience. 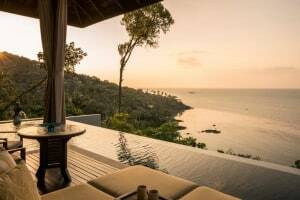 Boasting of gorgeous ocean views and serene environment, the infinity pool at Four Seasons is a lovely space to relax and immerse in the beauty of Thailand. 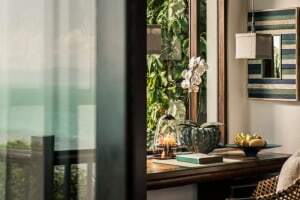 With a fine glass of drink in your hand and such a mesmerizing view ahead, make most of your vacation at Four Seasons Koh Samui. 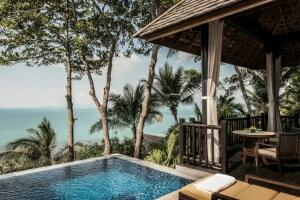 Four Seasons presents to you the Health Club, situated on the hillside and enclosed by the Gulf of Thailand view. The health club is fully equipped with all the workout equipment to keep you healthy and fit even during your vacation. Muay Thai kickboxing ring and watersports by the beach like water-cycling is also available for guests to use. For convenience of their guests, Four Seasons Health Club opens 24 hours everyday. 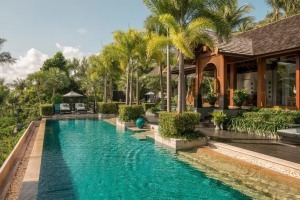 Four Seasons Koh Samui welcomes families and kids of all ages. Pets are allowed on request and special charges may be applicable. A child up to 2 years of age can use a cot in the room for free. 3-12 can use existing bed free of charge.